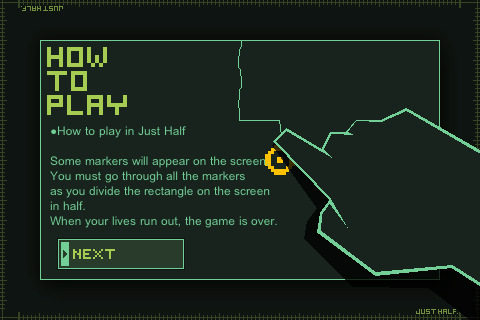 Just Half is an app game for the iPhone, iPod, and iPad and is released by PROPE Ltd. The game is you, the player, splitting a rectangle in half. No, seriously, that’s all there is. And even more crazy, it’s actually really fascinating. This app is really entertaining. It has two modes, the first being ‘Just Half Mode’ where your goal is to split the rectangle, hit a coin in the center, and make sure that both sides of the rectangle are even. You can draw any shape… a face, a squiggly line, zig-zags, ect… and as long as the area of one area is equal to the area of the other side, you’ll pass. I was truly amazed when I drew a ying-yang style pattern and the app’s calculations rewarded me for getting it near perfect. The second mode is the ‘Perfect Half Mode’ where you have to go for a perfect 50:50 cut down the rectangle. Again, you can use any sort of line you want, as long as the two halves are equal in terms of area, it will reward you. Even when you get a Bad rating, it’s still compelling enough to motivate you to improve. The app’s graphics are great. It all has a computerized look that works really well and the background musics is actually pleasant and surprisingly immersing. I felt like the game was really effective in capturing a theme and providing you the most deceptively simple concept to play with. If you want to kill time, install this app. If you want something that loads fast, plays fast, and engages you, then this is the app for you. I was surprised by Just Half, and I am keeping this game on my iPhone long after this review submitted. AppSafari review of Just Half was written by Joseph Ho on July 29th, 2010 and categorized under App Store, Games, Line Drawing, Universal. Page viewed 3333 times, 2 so far today. Need help on using these apps? Please read the Help Page.